Breanna Stewart, this year’s number 1 overall pick of the WNBA draft by the Seattle Storm, will pay tribute to the victims of the Orlando shooting in shoe form. 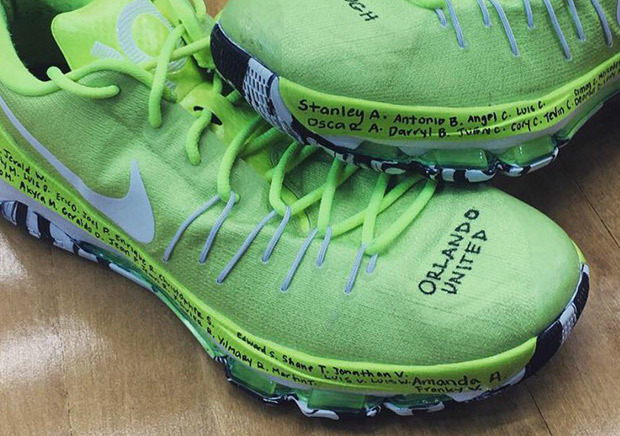 Tonight, she’ll lace up a KD 8 in bright green with the names of the victims written on the midsole of the shoes, with the messages of Orlando United and #Enough written at the toe-box of each shoe. This tragic event has been remembered across the nation, with moments of silence being exhibited before sporting events including the NBA Finals as well as the Stanley Cup Finals. Check out a full look at Breanna’s kicks ahead, and watch her hoop in these tonight as the Storm take on the Dallas Wings.